Egon Schiele's Bare Tree Behind a Fence (left) was painted one year before his Self-portrait as a Saint which we have already shown contains a large S for Schiele. Here - who needs to be shown? - there is a large E for Egon. 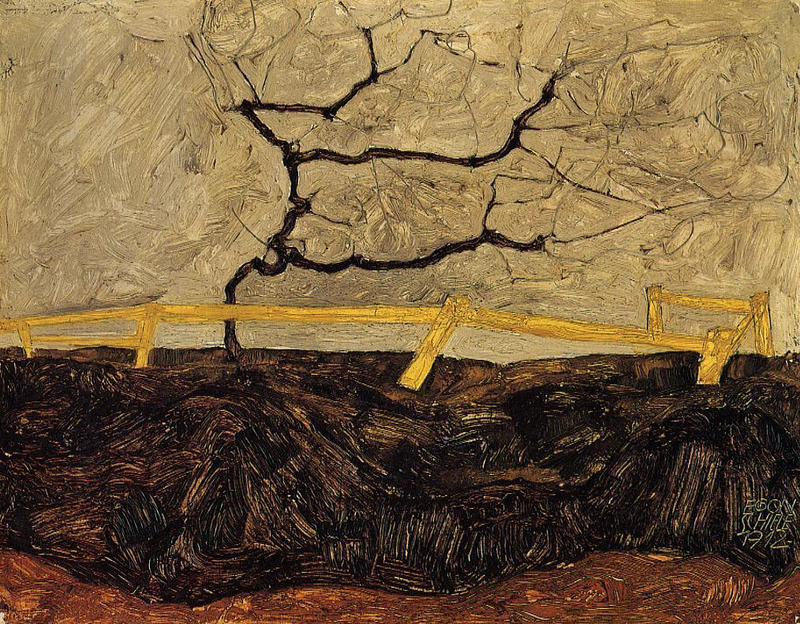 Schiele, Bare Tree Behind a Fence (1912) Oil on panel. Private Collection. If you look closer, though, you will see that each of the horizontal strokes of the E branch out into smaller E's, a tree-diagram perhaps of how every painter paints himself, his mind as the large E conceiving further images of his mind conceiving as one grows into the other. Though leafless in winter, the tree is rooted in the wisdom of the ages and its struggle to survive is a metaphor for the violence and mental struggle of creation. Is it a stretch, though, to read the image as inside his mind? I don't think so. 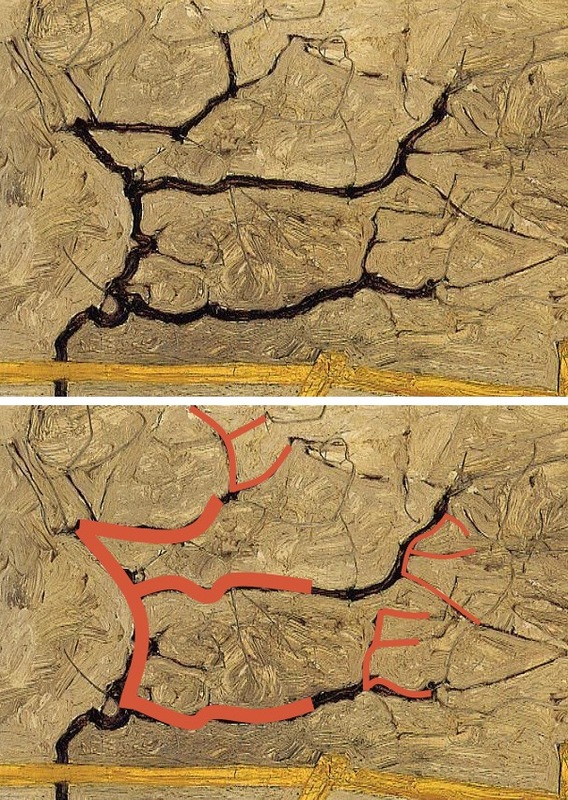 Not only does the concept conform to so many of the world's masterpieces, as shown on EPPH, but the earth transforms Schiele's own forehead and hair. A tree grows out of his "head". The area below the horizon is an extreme metamorphic close-up of his famous hairline. 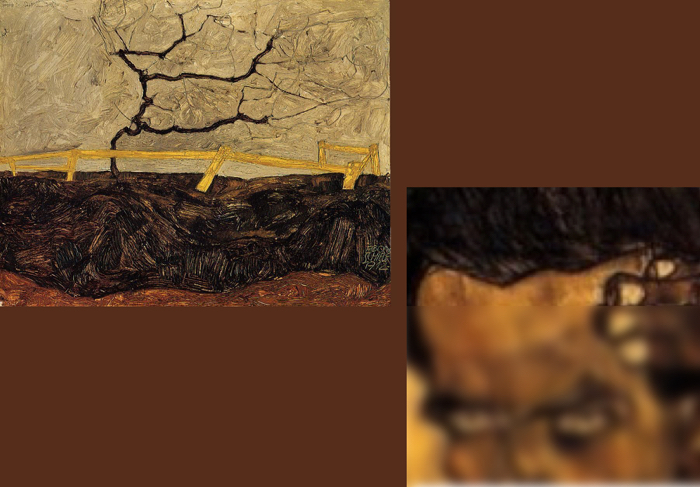 I have blurred the lower part of a 1910 self-portrait (right) to highlight this similarity. Schiele's method could have been inspired by the work of many different artists but this example is strikingly similar to some of Rembrandt's landscapes with their extreme close-up views of his own head. For comparison, take a look at Rembrandt's Landscape with a Stone Bridge (1638) and his etching of The Three Trees (1643). 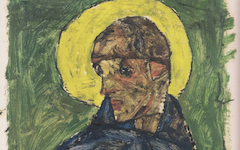 See explanations of other works by Egon Schiele. 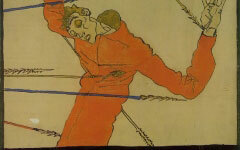 In a poster for an exhibition of his paintings (above) Egon Schiele drew on the age-old tradition of presenting St. Sebastian as a symbol for the artist himself suffering the pangs of artistic creation. In the epistle of an apostle, the letters matter; as they also do in the self-portrait of a prophet, even if self-proclaimed. Original Publication Date on EPPH: 15 Mar 2015. © Simon Abrahams. Articles on this site are the copyright of Simon Abrahams. To use copyrighted material in print or other media for purposes beyond 'fair use', you must obtain permission from the copyright owner. Websites may link to this page without permission (please do) but may not reproduce the material on their own site without crediting Simon Abrahams and EPPH.